My time as Karateka started as a twelve year old when, escorted by my Father I walked into Mr John Moreton’s Hull Baker Street Dojo, which was named the Central School of Karate. This was on October 14th 1974, which is proof that Martial arts (Karate in particular for me) can become a lifestyle and not just a fad. Even after all these years I still stay loyal to the teacher who inspired me to try and achieve my potential all those years ago and whom continues to inspire me today to keep attending on those hard training nights and to set goals which are realistic but ambitious. In everything we do we rely on someone for support and guidance along the way; it may be our Spouse, a friend, a family member or training partner. My Karate has needed all of those mentioned, far too many people to mention by name but all just as important to where I find myself today. 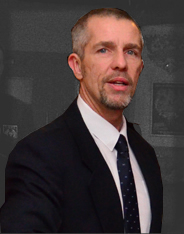 However, John Moreton, stands as the most influential person in the development of the Karateka that I am today. The explosion of Bruce Lee action films on to the cinema screen saw an increase in membership in Karate clubs across the country. David Carradine’s character, Kwai Chang-Caine, in the TV show Kung Fu in the 1970’s inspired my cousin to join a Karate club and I simply joined alongside him at his recommendation. Memories of my first Dojo are still vivid in my mind. I have no recollection of what the Dojo was used for during business hours but many memories of the evenings activities. If I close my eyes I can still see images of those who would attend. It would be wrong of me to mention people by name for fear of omitting someone who deserves a mention or offending one of the many characters that joined John’s classes. However, what I can say is that when I was a junior there were many people training whom I admired. There were those who I feared and those who even now I wouldn’t be able to work out! Some of these students still continue in the martial arts today although some don’t. Some have moved on to become professional coaches in other sports. The Dojo itself was far from ideal in today’s climate of health and safety. Long metal grilles that ran down either side of the floor would become dislodged when stepped upon with the risk of serious injury to the person near the other end! Although, to my recollection, no one lost a limb through training at least they didn’t during any of the sessions that I attended! One thing remains certain though; we were all shaped in some way or another by our experiences at the Baker Street Dojo. Training back then was hard work. We would train at least three nights per week with beginners, juniors and senior classes each having their own slots. This often meant there would be more than one class per night. Weekend courses would also be arranged and although you were not expected to attend you would for fear of missing out or falling behind your fellow students. Week long summer camps were also the norm. Training was tough, but I can say without any reservation it was all honest hard work with dedication from all those who participated. At this time we were affiliated to Mr Tatsuo Suzuki’s UKKW group and I had the pleasure to train under all of his assistant instructors. My fondest memories were training sessions instructed by Mr Sakagami and Mr Kobayashi, both of whom I graded under. Mr Kobayashi graded me to 8th Kyu in January 1975 and this set me on my way. During these times I also received one of my most treasured possessions, my Shodan certificate from Japan, signed by Mr Hironori Otsuka. Circa 1978 our club moved premises to the YPI on George Street Hull. This new Dojo was not far from Baker Street. However, we were sad to leave the old Dojo as we had such fond memories of the training sessions that we had held there. 1980, or thereabouts, saw two of John’s students begin to teach at their own Dojo with his full support. These instructors, Robin Russell and Jim McDonagh asked me to join them. The St Paul’s Church Hall was hired and training at a club bearing the same name began. As time passed several premises were used but the club has been based for many years now at the St Victors Mission, Walker Street, in Hull. On leaving the St Paul’s venue the name of the club was changed to the ‘Hull Zanshin Karate Club’. Robin and Jim eventually moved on to new ventures leaving me to assume control of the club. Teaching methods have moved on throughout all martial arts. Students are now encouraged, I feel for the better, to question their instructions more. However, I do feel saddened by the demise of the old system of “This is what I want you to do, watch and practice over and over and over again until you succeed”. This system is what I believe shaped me into the determined character I am today where if I have a task I will give it my all until I either succeed or fail, I will not give up along the way. This is, I feel, the one thing that is lacking in the character of the youngsters in our society today. They have never been instructed in, or noticed the benefits of, hard work leading to success. It is much easier for them to be disruptive or destructive and gain the so called respect of their peers and leap blindly into failure than to show resolute determination in some personal goal and gain the respect of society as a whole as they embrace success. I will always be grateful to John Moreton, Karate, my cousin and my father for the chance to succeed rather than fail. Competition is another factor in many peoples training. I have enjoyed success at this discipline, in both Kumite and Kata, and been lucky enough to travel to places like Belfast, Holland, and Paris on many occasions. It would have to be said though that the majority of my success was in Kata, where I still have a great passion. Nowadays, however, I get great pleasure in helping students take their early steps into competitive Karate, or enjoy sharing in the successes they achieve. As with most people I have my favourite competition successes, mine being three particular gold medals. Senior Men’s Team Kumite at the British Karate Do Wadokai Championships in Farnborough in 1987. Men’s -60kg Kumite at the 1st Open European Wado Karate Tournament in Nieuwegein Holland in 1991. Veteran Male Kata event at the AMA International in Nottingham in 2003. I have fond memories for these events simply because in the first one mentioned, I went through the entire competition winning all of my matches. The second event saw me winning not only a senior male Kumite event, but one which was also an International event away from home and the third event was special because it was Kata, which I entered just to encourage the juniors that were also competing! Circa 1991 John asked me if I would like to attend a Kata course being held in Manchester and loving my Kata practice I said yes! At the time I had no idea that the course was aimed at providing the English Karate circuit with potential officials for competition. I began to realise when I found out the course was to be held by England Chief Referee Mr Terry Pottage an old acquaintance of John. I remember enrolling and sitting next to a chap who I didn’t recognise until he introduced himself as John Van Weenen. At this point I was wondering if I was going to be the only novice there! That was not to be the case. I enjoyed the course and decided that day that I had entered the next stage of my Karate training. As the courses passed and with a successful written exam behind me, I managed to qualify as an England Kata official in 1993. At this stage with a young family I decided to concentrate solely on Kata competition, so that I would not be away from home too often. In March 2005 however I was awarded a British Kata official’s badge and decided it was time to attempt my qualification as Kumite judge. In September 2005 I passed as Judge “A” which meant that after a probationary period I would be eligible to attempt the Referee “B” qualification. 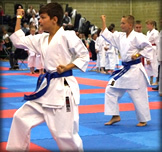 This I did at a recent competition in Reading and further success meant that as of summer 2007 my status as an English official covers both Kata and Kumite. At the British Championships in September 2009, I was awarded my British Kumite qualification. This completed my domestic qualifications and also saw me being used as a tatami chief with increasing regularity. In June 2008 at the European Championships for Regions, I added a probationary qualification as European Kata Judge 'B' following successful exams. This was ratified in Paris at the European Junior Championships in January 2009. Following on in the May of 2009 I attended the European Championships for Regions in Madrid and passed my exams for probationary judge 'A'. I ratified this qualification at the European Junior Championships in Izmir Turkey in February 2010.